in the heart of Old Town Winchester, Virginia. Come and visit this little gem of a music store, for lovers of fine instruments, including guitars, banjos, mandolins and other fretted instruments. Stop by and check out our hand-picked new, used and vintage instruments in a relaxed setting. Tuesday: By chance - Call Ahead! Follow us on Facebook or Reverb to get updates on new inventory, events and more. Come by. Jon Rose is happy to share his expert advice and skills. 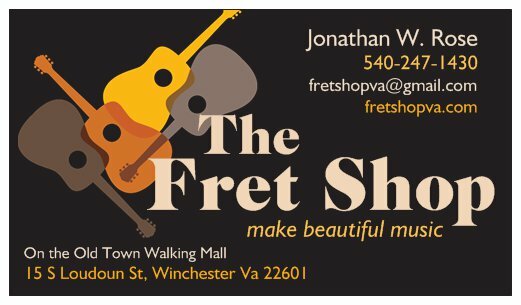 He loves what he's doing and happy to help you find just what you're looking for..... Jon has been playing guitar for over 40 years and has built and restored many instruments. If you have an instrument that could use a "tune up," new strings, a repair or restoration, stop by to discuss how we can help. We specialize in expert Repairs/Set-ups. With some attention, you can love your instrument again! If you're looking for an instrument for yourself or someone else, come by THE FRET SHOP, if we don't have what you're looking for in our current inventory, we are happy to special order or serve as your broker and search for it through our network. Take a look at what we have in the store or have recently sold in our Instrument Gallery. We're excited to share the accessories and instruments we've selected for their quality and value. We are always looking for fine instruments to buy and sell. If you've got something to sell, contact us. We may be interested in an outright cash purchase, consignment or trade-in. We may already know someone who is looking for your very guitar. Our Huss & Dalton and Bourgeois instruments are the kinds of guitars new CFM's wish they were. Lovely complex tones, which are defined, big, bold and balanced; the kind of tone that can only come from individually crafted guitars. These instruments are a joy to behold as well and are themselves works of art, heirloom guitars in every way that are great right out of the box. Please feel free to call Jon to ask specific questions about specific guitars (540-247-1430). ​ALSO, ask about our other Martin, Gibson, Guild, Fender, Eastman, and many many other available models.